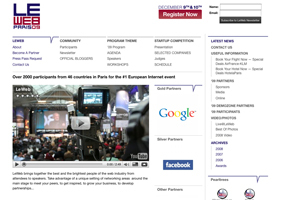 Orange has appointed George P Johnson to create its events space at European internet conference LeWeb. Orange is launching the Orange Application Shop at the conference in Paris on 9 and 10 December. The mobile phone company has employed George P Johnson to create its networking lounge and demonstration at the conference, which is anticipated to attract 2,000 delegates. George P Johnson managing director Kim Myhre said the Orange account is being handled by the agency's London office, which is working with Orange's corporate events, hospitality and brand teams in Paris and Orange Partner in the UK. "We are excited about working in partnership with Orange and playing a key role in helping it achieve its objectives," said Myhre. Technology: To meet, or not to meet ..